Oh Paris, the most beautiful city in the world! Are you living in Europe and you are planning a city trip? Are you from overseas and planning an Eurotrip but don’t have a lot of time? Then you are in the right place! If you have minimum time but want to see the maximum possible in Paris, then keep scrolling! Start your first day in Paris with a coffee & croissant in Montmartre, close to the basilique of Sacré Coeur. After you got some energy, head to the basilique and soak up its beauty. 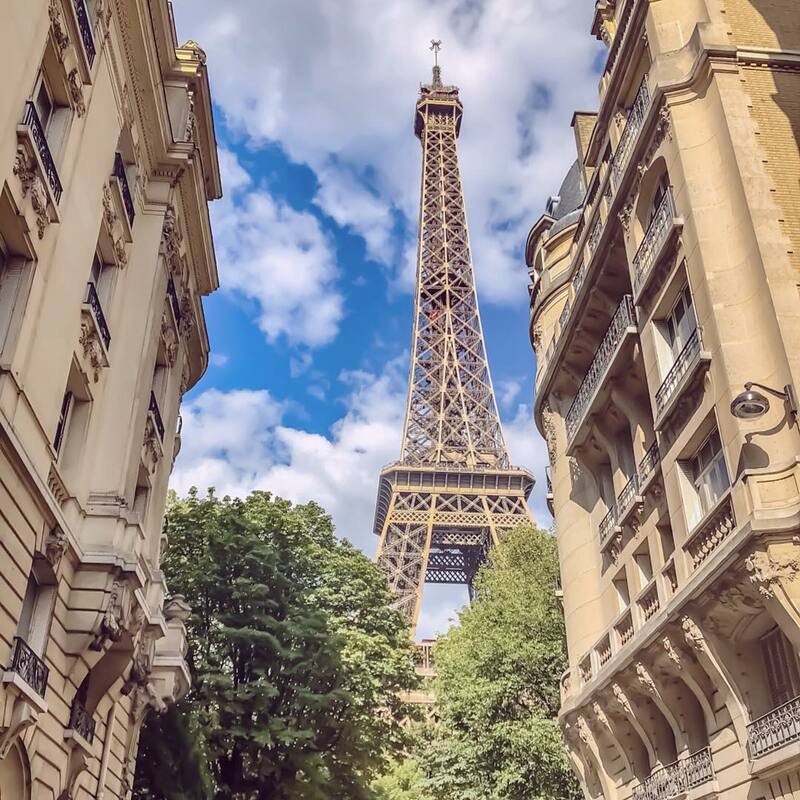 If you have the energy, you can go up the stairs, for a beautiful view of Paris! If you are a fan of the arts & literature, you can do some research ahead of time, on which writers and painters lived in Montmartre, and where! Make you way from Sacreé Coeur to the I Love You Wall, and find your language! The I Love You Wall (Le mur des je t’aime) in Paris was created by two artists as a rendez-vous location for lovers and a lasting monument to eternal adoration. After walking in Montmatre, we passed by the wall and I had to take a photo of me pointing out to the “I love you” in my native language, out of 250 different languages. If you are a fan of walking, you can walk from the tower to the Tuileries Gardens and the Louvre. Like that, you can walk along the Seine and see the beautiful bridges! Otherwise, take a metro and save yourself some time and energy! once you are at the Tuileries Gardens, again, take your time and enjoy it! Don’t forget to take plenty of photos at the Louvre. If it’s still open and you have time, go inside and check it out! The museum is a monster, but if you have specific artists of works of art you want to see, then give it a go! Finish your day with a nice Parisian dinner, accompanied by some good wine and cheese! After fueling, head back tot the Eiffel Tower to see it at night! It’s been a long day of walking, sight seeing and taking photos, so make sure you get a good night’s sleep! If you are a museum fan, then wake up rather early and check out the Musée d’Orsay and the Museée de l’Orangerie. If you want to see both, take a combo ticket to save yourself some euros. While the Musée de l’Orangerie is rather small, the Musée d’Orsay is quite big and can take you a few hours if you want to see everything. What is the Musée d’Orsay? The museum is housed in the former Gare d’Orsay, and it’s now housing the largest collection of impressionist and post-Impressionist masterpieces in the world such as Gauguin, Van Gogh, Monet, Manet, Renoir, Degas. What can you see in the Musée de l’Orangerie? Monet’s water lilies. You can see there 8 beautiful murals. The museum hosts impressionist and post-impressionist paintings and it’s located in the Tuileries Gardens. It’s a nice and short walk from the Musée d’Orsay. After taking your time, you can go for some shopping & coffee on the Champs d’Elysées! You can either go for an expensive coffee or for a McDonald’s coffee! Minimum price for good coffee and fancy location! At the end of the street, there is the beautiful Arc de Triomphe! There are many photo opportunities there and make sure to walk around and catch various angles, but be careful with the flocks of tourists that are dropped by buses. If you have time and don’t have to catch your train/plane/bus to your next location or back home, you can finish your day with another museum (I would suggest the Pompidou) and a nice dinner. Fed up of Millenial Pink? Check out Purple Beauty! Montmartre is my favourite place in Paris. I really need to go back. I went to Paris a couple of years ago and really regret not going to the Louvre – we went past but the queue was so long! Never been to Paris but want to! Those pictures look beautiful. Oh I love Paris and haven’t been in years! Your photos captured the essence of it quite well!